Rashes around and in an infant's mouth can have several causes. The most common cause of a mouth rash in infants is oral thrush, which is rarely serious and usually resolves itself without treatment. 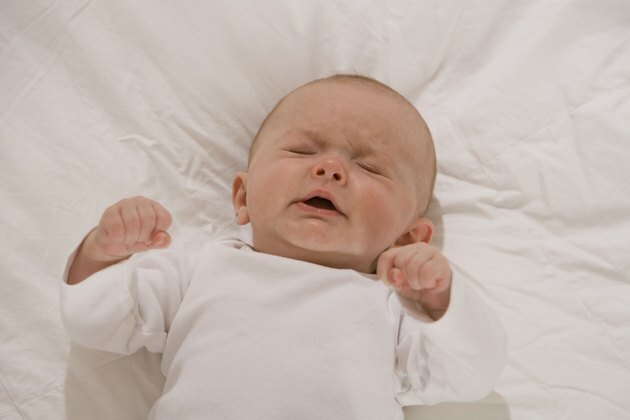 While much less common, a mouth rash in an infant can also be a symptom of impetigo, cold sores, chickenpox, strep throat or hand, foot and mouth disease. A common cause of mouth rash in infants, especially infants less than 6 months old, is oral thrush. Oral thrush is caused by an overgrowth of the yeast Candida albicans. Candida albicans is the same yeast responsible for vaginal yeast infections and yeast diaper rash. People naturally have Candida albicans in their mouths and digestive tracts but their growth is usually controlled by beneficial bacteria and a healthy immune system. Oral thrush is common in infants because their immune systems are not yet fully developed. Oral thrush can also occur in infants after they have received antibiotics, which kill off beneficial bacteria, or have been treated with steroids for conditions such as asthma and lung disease. A baby with oral thrush may have cracked skin along the corners of his mouth. There may be thick, white patches that look like cottage cheese on his lips, tongue and inside cheeks. Underneath these white patches is red tissue that bleeds easily when you try to scrape the lesions off. The white patches, which cannot be wiped off, may increase in size and quantity. While some babies do not feel any discomfort from oral thrush, some may have sore mouths and have difficulty eating. Treatment of oral thrush in infants is usually not necessary because it resolves itself within a week or two. See your pediatrician if it does not get better after two weeks or if it prevents your baby from feeding. Your pediatrician may prescribe an antifungal solution to help eliminate the white patches inside his mouth and reduce discomfort. If your baby is old enough to eat solid foods, your pediatrician may recommend feeding him yogurt with lactobacilli, which will add beneficial bacteria into his body to balance out the yeast. It is important to alert your pediatrician if your infant routinely develops oral thrush because it may be a symptom of another health issue. Other less common causes of mouth rashes in infants is impetigo, cold sore, chickenpox, strep throat and hand, foot and mouth disease. Impetigo is a skin infection that first shows up as itchy, red sores that look like blisters and then turns into honey-colored crusts. Impetigo usually occurs in preschool and school-age children who repeatedly scratch an existing rash or sore. Red or purple sores on his lips or outer edges of his lips may be cold sores, which infants can get from being kissed and sharing utensils with infected adults. Chickenpox, which will be accompanied by sores or blisters in other parts of the body, is unusual in infants since they get antibodies against the virus while in their mother's wombs but can happen. A baby with a sore and red throat, along with white patches on his tonsils or throat and a rash somewhere else on his body, may have strep throat. Painful sores in the mouth and on the palms and feet may be hand, foot and mouth disease. See your pediatrician for an accurate diagnosis if you suspect that your baby's mouth rash may be due to one of these conditions.